SchoolVoice is a reliable platform for efficient school-parent communication using smart technology and simple interface that saves time and cut costs. Giving schools the ability to send unlimited messages with unlimited characters, schools can now communicate as much as they need with parents everyday making sure parents are engaged and updated. SchoolVoice is available as a mobile app for parents for iOS and Android mobile devices. How can parents respond to messages they receive from schools via SchoolVoice? What languages does SchoolVoice support? SchoolVoice is currently available in English for the Admin Portal and in both English and Arabic for the parent mobile app (Android and iOS). Who controls the messages the parents receive? The school does. SchoolVoice allows your school to delegate responsibility to one or more teachers and/or admins who get to send messages to parents using a simple desktop admin portal. What can schools send to parents using SchoolVoice? Using SchoolVoice, Schools can send any information to parents like daily updates, event announcements, important reminders, student performance notes or bus delays. You can attach a photo to your message. SchoolVoice also has a special Emergency message alert function to let parents be informed of urgent events that just cannot wait whether it be a bus delay due to bad weather, a fire at school or a child injury. What do our school get if we sign up now? As soon as you sign up for SchoolVoice, you will get a smart communication solution that includes a desktop admin portal for your school as well as a FREE mobile app that allows parents to receive and reply to messages instantly using a set of predefined responses to increase deliverability rates. A dedicated account manager will be responsible for your school success with SchoolVoice and your overall satisfaction. Our team is always ready to give your school any Offsite support you might need by phone and email or onsite if required. Is SchoolVoice an environmentally friendly platform? SchoolVoice helps schools achieve their Environmental Objectives by keeping parents up to date without them having to cover their fridge with school reminders and schedules. Save paper and printing costs with a 100% digital platform. How can I make sure the message was delivered/read? SchoolVoice helps you track messages by automatically generating reports that provides information about the deliverability and interaction from parents. How do parents get SchoolVoice? Parents can download SchoolVoice directly to their mobile devices from Google play store (Android) or App store (IOS) and it is available on our website. What if the parent forgot to check SchoolVoice? 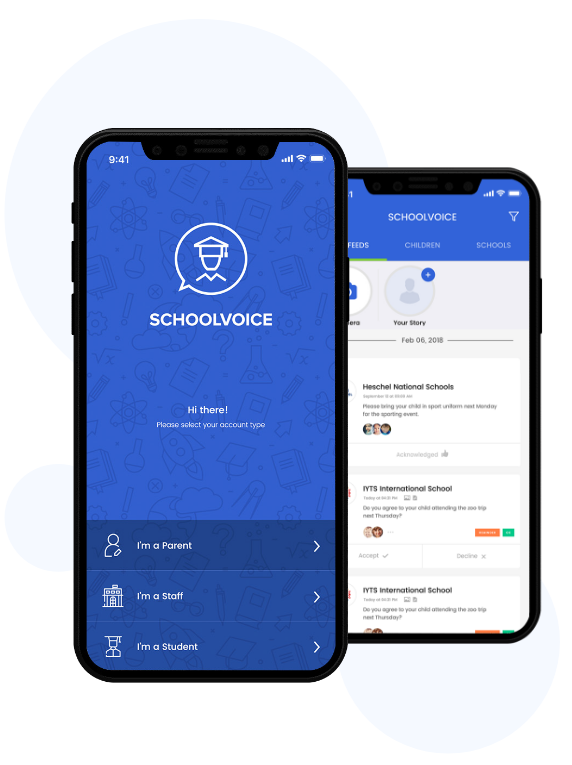 SchoolVoice as an app is different from emails and websites where the parent needs to check for updates; instead, the app uses the push notification technology to notify parents instantly about the received messages. A special loud siren is used in case the school sends an emergency message. Email can be very useful and above all free. Some drawbacks hinders effective school-parent communication however. E-mail addresses are sometime outdated or incorrect which results in emails ‘bouncing’ back. SchoolVoice will eliminate these issues using the emergency notifications feature in case of urgent matters. Newsletters are great and they would render several advantages to your business. Still, communication challenges exist. Newsletters can be expensive, time consuming, and by the time you receive it, it will be missing up-to-date information unlike the app on the smart devices. An educational portal is an information repository. It is not an efficient communication tool. SchoolVoice compliments the Portal system but does not replace it. What technical knowledge does SchoolVoice require? SchoolVoice requires no technical background whatsoever. If you can use Facebook or Google, you can use SchoolVoice. Does SchoolVoice affect the school’s IT infrastructure? No. SchoolVoice is a web-based solution, which means there is no impact on your existing IT systems or infrastructure. How long does it take to launch SchoolVoice? For the initial registration and activation, it will not take longer than a couple of minutes. How does schools update SchoolVoice? Updating is quick and simple. Administrators are assigned an access level to the Admin Dashboard. What if schools require support? SchoolVoice offers telephonic and email support to both parents and schools during normal business hours. We will offer your school all the support when needed. How can the school notify parents to start using SchoolVoice? We provide the School with an announcement document for distribution via email or in hardcopy to the parents, which contains all the relevant information. Is the school’s information protected? Yes, SchoolVoice is a secure platform. Our servers are based in UAE and have the necessary certification that will secure instant messages being sent. No parent can view other parents’ information via SchoolVoice. No information on SchoolVoice public or visible to third parties under any circumstances. No parent can view other parents’ information via SchoolVoice. Netaq soft for electronic solutions will never make any information on SchoolVoice public or visible to third parties under any circumstances.